Are you having trouble deciding what candidate to vote for this election season? Have no fear! I’ve got just the right candidate for you! We’ll have to bring him back in time, but I promise he’s a better choice than Donald Trump. Ya know, now that I think about it, William Shatner himself would be a better candidate than Trump. And he’s Canadian! It’s too bad we can never get a Shatner/Nimoy ticket. 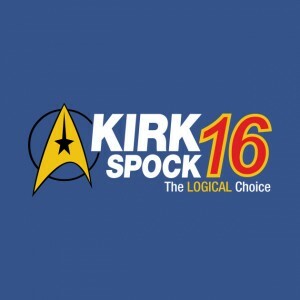 But Kirk/Spock is the next best thing. Just make sure to take him back in time before he gets promoted to admiral. That way he won’t know what a bad idea it is for him to gain any more power than Captain.